with optimized development and delivery pipelines. DevOps makes the paradigm shift possible from the large scale, project based system implementation to continuous evolution of applications, allowing our clients to deliver faster with greater business agility. It's a positive disruptor that brings people, processes and technologies together, enabling the enterprises deliver applications at the pace of business. DevOps improves efficiency and quality in software development. With our custom DevOps solutions, we provide the businesses ability to consistently roll out improved business capabilities. DevOps testing is a critical enabler and accelerator of digital transformation. It significantly reduces the costs associated with root cause analysis, and enables the businesses release high quality software smoothly and continuously, without having to go back to fix the issues. Assessing an organization's existing environment for agile adoption, automation and solution architecture for end-to-end delivery pipeline with faster time-to-market. Implementing automation at scale by provisioning and setting up environments for frictionless self-service and making the team more compliant. Managing the desired state of infrastructure and applications to automatically remediate any configuration drifts, allowing you more time for core business and lees time fighting fires. Blending the work products of individual developers into a shared central repository for early detection of bugs, tighter integration and providing anytime current builds for testing. Continuously monitoring your applications, infrastructure and logs for improved collaboration, quick and efficient incident management and enhanced end user experience. Providing framework to develop, customize and deploy applications for a business's major needs related to API management, seamless integration and support across multi-cloud environments. 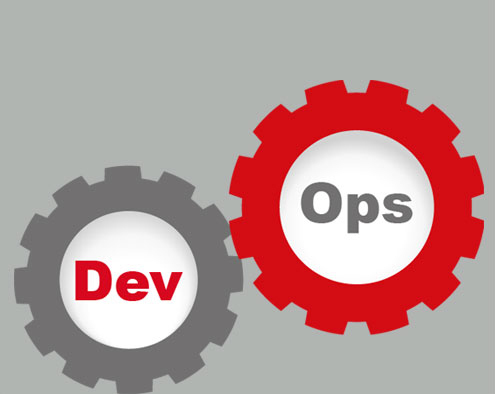 DevOps automates and standardizes the processes for infrastructure deployment within an enterprise where they can achieve innovation faster with improved operational efficiency, better deployment quality and thereby more time to focus on business objectives. Our DevOps experts provide strong source control and elasticity in cloud computing, and automate monitoring for flawless execution of processes. Our teams share the common objectives and work leveraging lean principles and continuous delivery of value for best business outcomes. Our work culture requires us to experiment without request. Our teams run tests frequently to minimize the incidents of failures and rollbacks, and review their work regularly for continuous improvement. With fine-grained service architecture, we are capable to achieve fast mean-time to recovery for businesses. We help organizations accelerate their DevOps architecture transformation with smarter operations for superior technology outcomes. Our range of DevOps expertise includes continuous build, integration & delivery, culture and sharing, stability and change management, self-service configuration and more. DevOps offers a range of technical, cultural and business benefits such as less complexity to manage, more productive teams and more stable operating environments . Technology stack for all your DevOps needs that allow the integration of project changes more easily and provide the organizations ability to provision, secure and run any infrastructure for any application, meeting compliance and regulatory requirements. DevOps journey requires preparation for a cultural shift, code change committed to secure control system triggers, automated test, application deployment to test the environment and monitoring for continuously high performance. Why Choose Flexsin for DevOps Consulting and development Services? Extensive expertise in delivering large agile engagements. Tools and accelerators for test automation for improvised output. Consulting for DevOps strategy, integrations, adoption and maintenance. Release automation and service virtualization. Flexible engagement models as per project and business needs. Highly experienced and well trained DevOps experts. DevOps significantly reduces project delivery time by nearly half compared to traditional approaches, allowing you more time to devote on framework enhancements. As you spend less time in administrative support, team's output is improved due to better communication, collaboration and co-ordination among the members. Automation and used of advanced tools simplifies the process and improves performance. Improved performance of all systems of an organization including legacy systems. Speed of production improves while software deployment time is reduced significantly, allowing you to concentrate more on your key business functions.